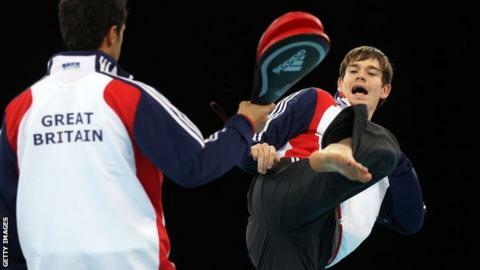 Taekwondo star Aaron Cook says he found switching nationality "easy" as he prepares to fight for Moldova at the inaugural European Games in Baku. Cook, 24, competed for Great Britain at the 2008 Olympics, but was overlooked for London 2012, despite being ranked world number one at the time. He then moved allegiance to the Isle of Man before changing again to Moldova earlier this year. "I am happy with my new country and the way everything is going," he said. His Moldovan citizenship was funded by the country's taekwondo president and billionaire Igor Iuzefovici. Cook will be the top seed in the men's -80kg category and could face his former GB team-mate and rival, Lutalo Muhammad in Thursday's semi-final. Muhammad was selected in Team GB ahead of him for the 2012 London Games. How can Cook switch nationalities? Footballers cannot switch nations after representing one country in a competitive international, but there is no such rule in Olympic sports. The Olympic Charter rules that three years must pass between an athlete representing one nation and switching to another. Cook last competed for GB at the European Championships in May 2012, meaning he would be eligible to switch in May 2015. However, the BOA believe that competing for the Isle of Man - a British crown dependency - counts as a British appearance. That meant Cook either had to take the issue to court, or gain approval from the BOA. "It would be nice to fight him, but I will fight anybody. "Everyone is the same to me now. It's just another country. They are just like any other team, like Spain or Turkey. Just another competitor standing in my way." Cook, who is a three-time European champion, claimed bronze for Moldova at last month's world championships in Russia. He said the possibility of standing on the podium in Baku listening to a different anthem was a "strange proposition" but that he was "not really bothered". "The national anthem doesn't really mean that much to me any more," the Dorset-born fighter said. "I am fighting for myself when I am there. I have found it very easy. It's exactly the same mat, the same arena. It is just that I have different letters on the back of my suit. "I had to move on. Now it is about looking at the future, not worrying about the past. Moldova have given me all the support I need, so I am extremely grateful for everything they have done. Cook's girlfriend Bianca Walkden recently won gold for GB at the Taekwondo World Championships.